In order to define flight requirements, a series of ground and airborne simulations was completed by NASA with the support of several field centres. At the Marshall Space Flight Center (MSFC) in Huntsville, Alabama, a Concept Verification Test (CVT) programme was assembled on 25 July 1973, with the aim of simulating high data-rate experiments on the ground to test data compression techniques. These also included data interaction and onboard processing.5 In order to support ESA's development work on Spacelab (and in part to reduce costs in developing experiments that could be flown in space), a general-purpose laboratory resembling the Spacelab configuration was added to the CVT at Marshall in January 1974. After reviewing the original facility, it was suggested that the CVT version should be upgraded to resemble the design of Spacelab more closely. A Preliminary Requirements Review for the new simulator was held on 29-30 May 1974. The CVT Spacelab test programme was established to provide participation by principal investigators who were developing potential experiments for Spacelab missions. This would allow them to test hardware, techniques and interfaces in order to verify their operation prior to assignment to specific missions. CVT Test No. 1 (Jan 1974) with experiments conducted in ionospheric disturbances, atmospheric cloud physics, metal alloy preparation, high-energy astronomy and super fluid helium. CVT Test No. 2 (Spring 1974). Little information is available about this test, other than the date it was conducted. CVT Test No. 3 (15-19 Jul 1974) with an integrated life sciences mission planned and conducted by scientists from the Ames Research Center. The objectives were to demonstrate the protocols of each candidate experiment, module housing units, the rack-mounted equipment and other techniques. CVT Test No. 5 (10 Aug 1975) was a multi-discipline, multi-centre simulation, which also provided valuable information on the standardisation of hardware, crew training, communication requirements and procedures for dealing with equipment failures. 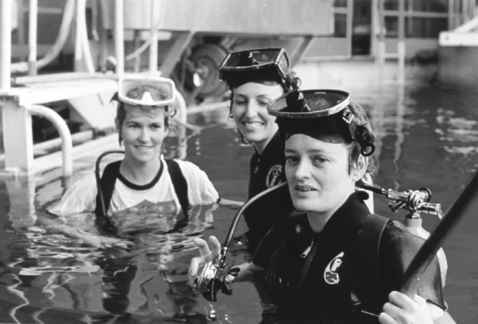 (From left) Dr. Mary Helen Johnston, Carolyn Griner and Dr. Ann Whitaker complete a Scuba diving training exercise at the Marshall Space Flight Center's Spacelab Neutral Buoyancy Simulator in preparation for CTV Test No. 4 in December 1974. Manned Spaceflight, but their replies were very negative. Other facilities and simulations had superseded the CVT programme and this response signalled its demise, although two other planned simulations were completed first. CVT Test No. 6 (17-21 Nov 1975) was a materials sciences simulation to determine whether a team of scientists, with moderate experiment operations training, could operate a package of experiments "in orbit". During the test, they were monitored via downlink TV and two-way voice communications by a team of principal investigators. CVT Test no 7 (15 Jul 1976) was the final CVT simulation and used a high-energy cosmic ray balloon experiment to gather scientific data. In the NASA Spacelab history, author Douglas Lord stated that the CVT "had provided very useful information and operational experience, [but] the program fell victim to the vagaries of organisational and budgetary life. "8 At the same time as the CVT programme was running, another series of Spacelab simulations was being conducted, with more participation by the scientist-astronauts.